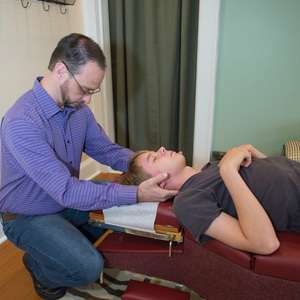 When he was 13, Dr. James attended a chiropractor’s lay lecture with his mom. ‘’It was like a lightning bolt. I got hooked by the chiropractic story.” Hearing about the body’s innate intelligence and our natural healing capabilities struck a chord, and he made the decision to pursue a career in chiropractic. He also took extra courses in pediatric chiropractic and holds a certification in the Webster Technique, which helps pregnant women to have a comfortable pregnancy and birthing experience. He’s currently working on a master’s degree in sports health science to work with professional and Olympic-level athletes. Another influence on Dr. James’s adjusting style has been his proficiency in martial arts. Over 25 years of training has allowed him a depth of sensitivity in reading people’s bodies. ‘’One of my goals is to make any adjustment as gentle as possible, using very little force to move in harmony with the body.” He can often notice things other chiropractors and health practitioners may have missed. That’s because his martial arts expertise allows him to look at participant care through a different lens. Dr. James has a family connection to chiropractic, with a sister and brother-in-law who both practice in Maine. His background also includes experience in performance art, having worked as a stunt performer for Medieval Times. Where his duties included: riding horses, jousted and sword fighting. His experience brings him another unique understanding of the demands an active life places on the human body. We’re open late and offer same-day appointments. Get started by contacting our practice today!